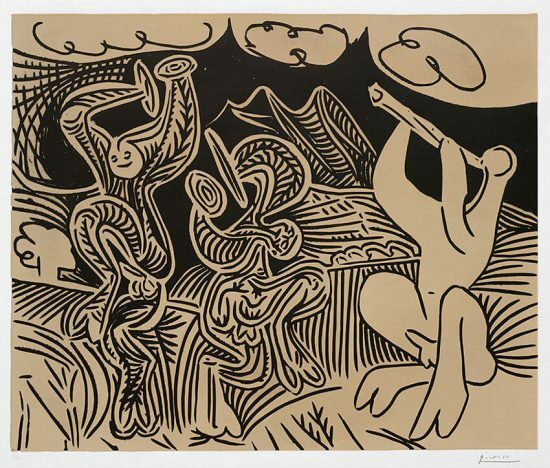 Numbered from the edition of 75 in pencil in the lower left; published by Maeght, Paris, printed by Mourlot, Paris. 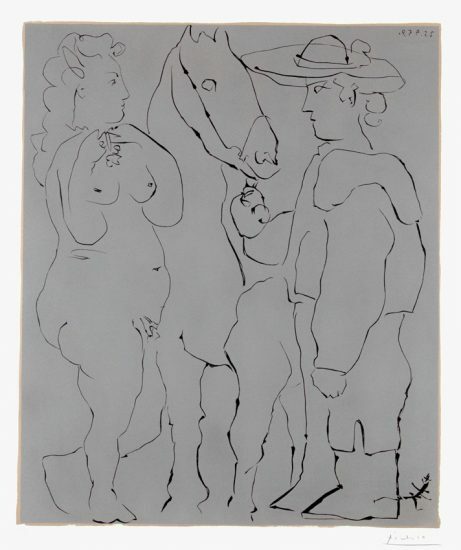 This work is hand-signed by Georges Braque (Argenteuil-sur-Seine, 1882- Paris, 1963) in pencil in the lower right. 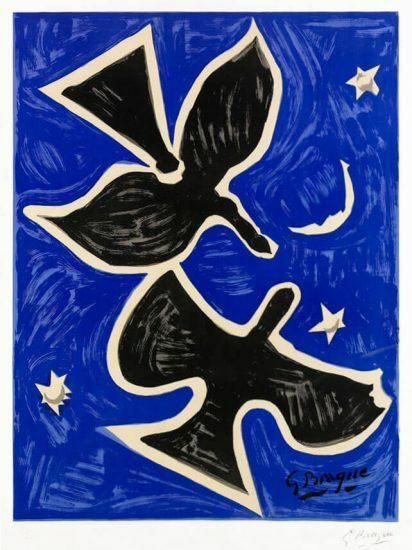 Braque Astre et Oiseau (Star and Bird) I, 1958-59 is a darling image of a bird in flight. 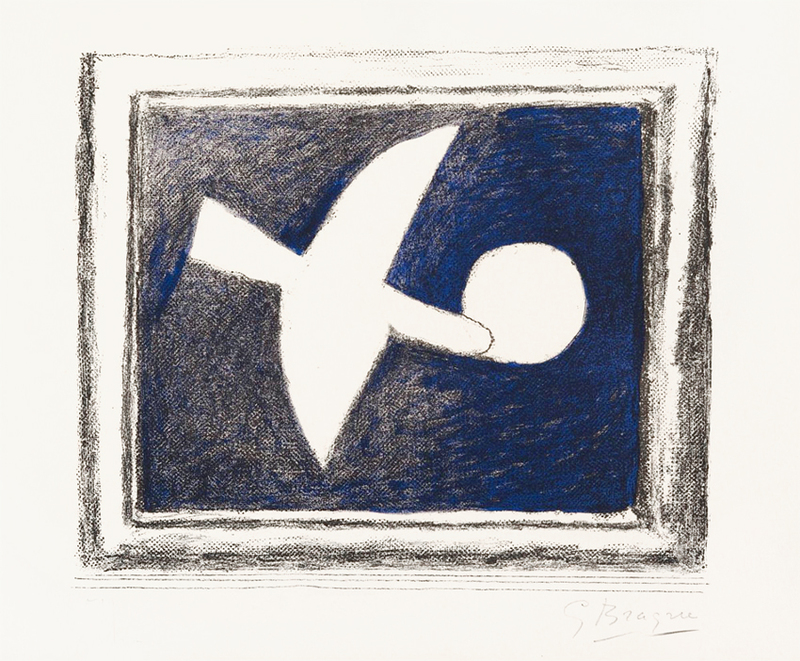 The bird motif frequently appears in Braque’s works. For the artist, the bird is a poetic display of innocence and freedom. In this lithograph, a giant white dove is seen in mid-flight. Its wings are spread wide, dramatically illustrating its fluid movement. 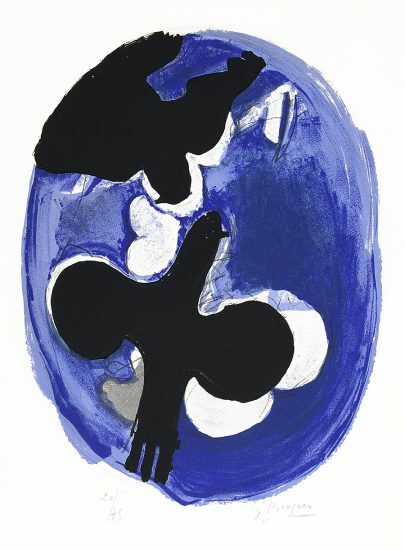 The bird is in a flattened form reminiscent of Braque’s Cubist beginnings. Located directly in front of the bird is a pale full moon that looms prominently in front of the image. Behind the bird are rich shades of blue and black, signifying the night sky. The white dove contrasts dramatically against its darkened background. Framing this scene are black lines aligning to encase the image in a rectangular frame. It is as if the artist hoped to give us a brief snapshot of a passing moment in the night. Viewers cannot help but wonder of the bird’s final destination and its eventual fate. This enigmatic piece is a visual puzzle in itself. 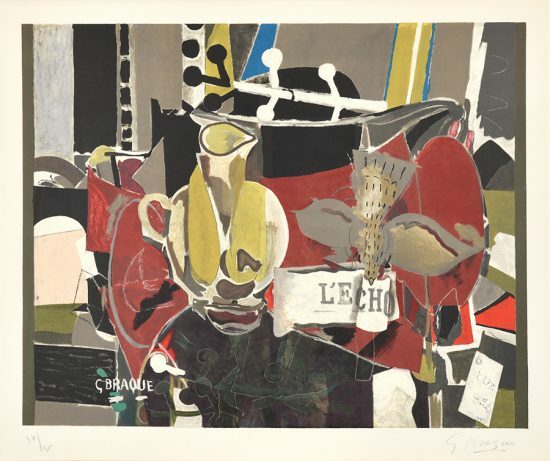 Created in 1958-1959, this color lithograph on Arches paper is hand-signed by Georges Braque (Argenteuil-sur-Seine, 1882- Paris, 1963) in pencil in the lower right; numbered from the edition of 75 in pencil in the lower left; published by Maeght, Paris, printed by Mourlot, Paris. 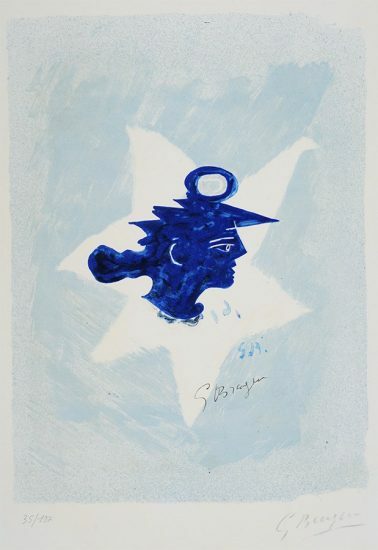 Braque Star and Bird (Astre et Oiseau) I, 1958-1959 is fully documented and referenced in the below catalogue raisonnés and texts (copies will be enclosed as added documentation with the invoices that will accompany the final sale of the work). 2) A Certificate of Authenticity will accompany this work. Framed to museum-grade, conservation standards, Braque Star and Bird (Astre et Oiseau) I, 1958-1959 is presented in a complementary moulding and finished with silk-wrapped mats and optical grade Plexiglas. 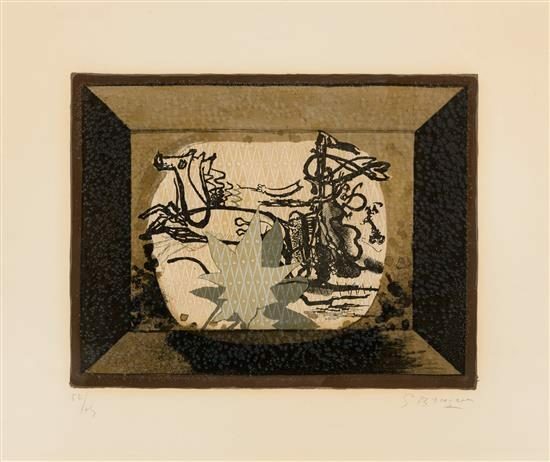 Considered one of the most important artists of the 20th Century, Georges Braque's prints are dynamic. 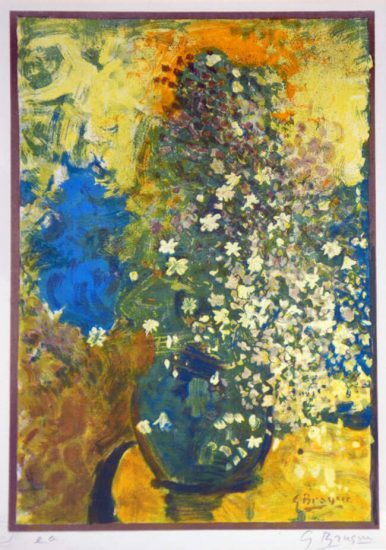 Braque's cubism, still life, birds, and flowers speak to change and sentiment in various styles and interpretations. 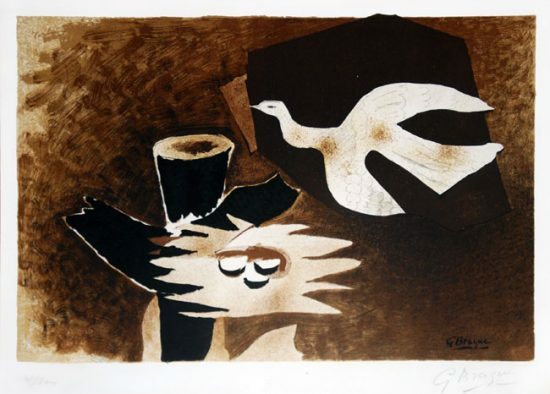 Sell your Georges Braque fine art with us. We offer free evaluations.